C.I.G.’s gem appreciation courses “Gemstones”, “Diamonds’, “Jewellery, History and Design”, “Pearls, Jade and Opals” and “Gem Identification” are designed for the person who wishes to discover the fascinating world of gems and jewellery.You can start right away by registering on-line for any of the following courses. Please download brochure (PDF). This is a general interest course introducing the basic identifying features of all important gems, including their appearance, special physical and optical characteristics, their occurrence and value factors. Also included is an introduction to diamond and colour gem grading, the use of gemmological instruments to aid identification. 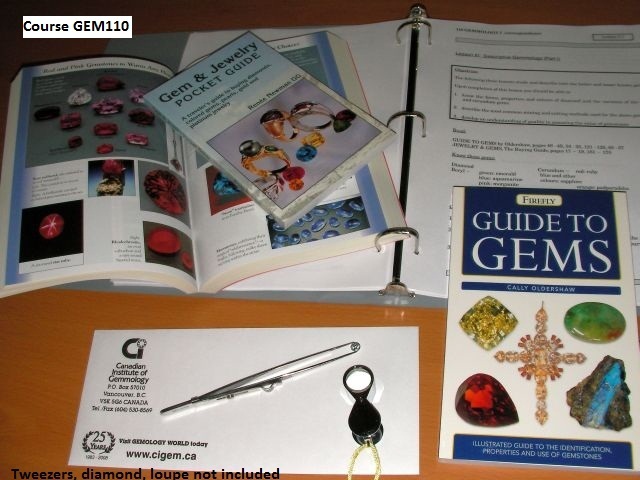 Fee: CAN$ 495 for home-study course (other countries US$ 495 plus US$ 45 shipping within USA) with text: Guide to Gems and the Gemstone Buying Guide. BONUS: 46 pages booklet “Gem Varieties”. This course has 10 lessons and is only available by correspondence. Certificate upon completion. No pre-requisites. GEM120 Gemmology II complements this course and can be taken concurrently. Course Content: 1. Nature of Gemstones (1), Diamonds and Corundum 2. Nature of Gemstones (2), Beryl and organic gems 3. Crystal Structure and Origin of Gems, Opal, Topaz and Jade 4. Gem Cutting and Care, Garnet, Quartz and Spodumene 5.Gemstone Identification (1), Tourmaline, Chrysoberyl and others 6. Gemstone Identification (2), Diamond Grading (1) 7. Gemstone Economics, Markets and Values, Diamond Grading (2) 8. Colour Gem Grading and Appraisals 9. 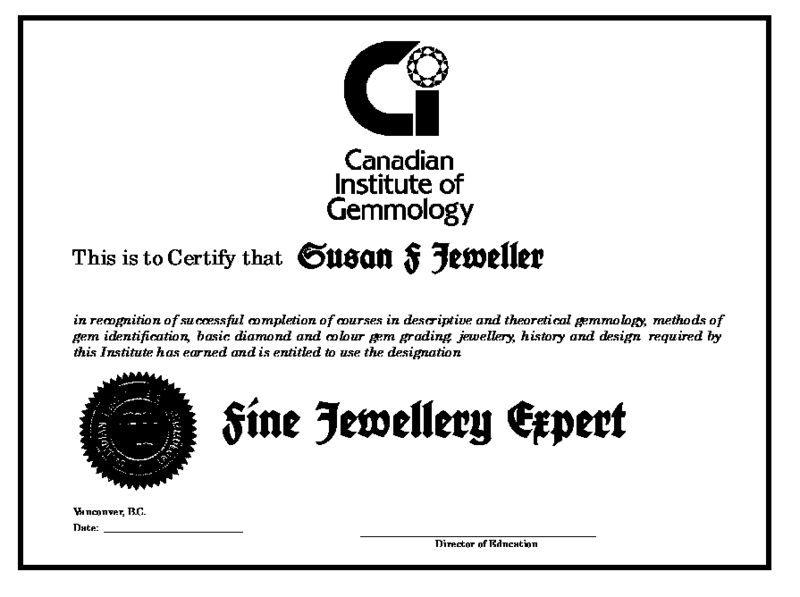 Gem Enhancement and Synthetic Gems 10. Review, Jewellery Manufacture, History and Fashion. “Thank you for a fascinating course” – Katarina McKenzie, West Vancouver, B.C. This theoretical course covers the physical and optical properties of gems such as refraction, reflection, gem crystallography, pleochroism, absorption spectra, etc. It explains the various instruments used in gem identification. The textbook “Gemmology, 3rd edition, 2007” by Peter G. Read follows closely the Gem-A preliminary syllabus exam requirements. Peter Read has prepared answer sheets exclusively for C.I.G. students taking this course. Fee: CAN$ 445 for home-study course (other countries US$ 445 plus US$ 45 shipping within USA); text-book Gemmology by Peter Reid included. The course contains 12 correspondence lessons with essay type questions. Comprehensive answer sheets will be provided to prepare for the written exam.. Course Type: This course is only available by correspondence. Certificate upon completion. GEM 110 recommended pre-requisite. NEW for 2017/18 – We have combined GEM 130 Diamonds and GEM 140 Jewellery, History and Design into this new correspondence course GEM 130/140 Diamonds, Jewellery, History and Design. Students will learn everything they need to know about diamonds. Definition, formation, extraction, and distribution of diamonds. The 4 Cs: carat weight, color, clarity and cut. Sell more and answer customer questions with confidence. Introduction to diamond grading and jewellery fashion. Course Content: 1. Diamonds. How they are created. 2. The Beauty of Diamonds 3. Weight and Colour of Diamonds. 4. Judging the Clarity of Diamonds. 5. Judging the Cut of Diamonds. 6. Diamond or Imitation? Gold, Platinum. 7. Choosing an Appropriate Style. 8. Choosing a Diamond Ring, Judging Craftmanship. 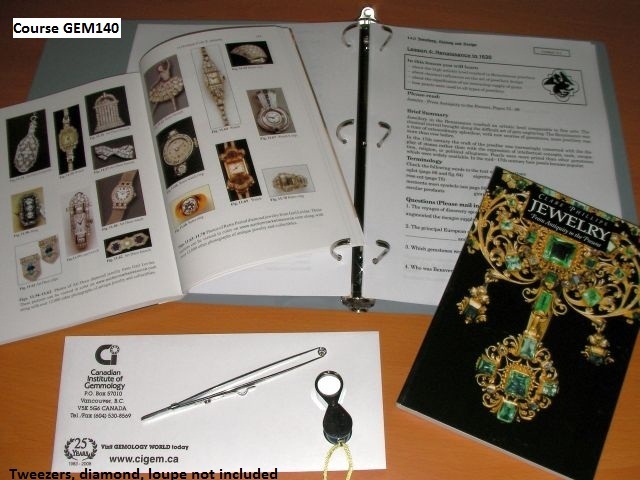 This course is a must for all jewellery collectors and enthusiasts. In ten lessons a survey of jewellery from the ancient world to the present day will be taken. Using the text-books as a visual guide students explore the varied styles, techniques and materials used from ancient Egypt, Greece and Rome to modern times showcasing the development of Western jewellery. In this intensive practical course you will use basic gem testing equipment necessary to identify natural, imitation and synthetic gemstones and their treatments. In 10 lab assignments students will identify between 50 and 60 gemstones including synthetic stones. 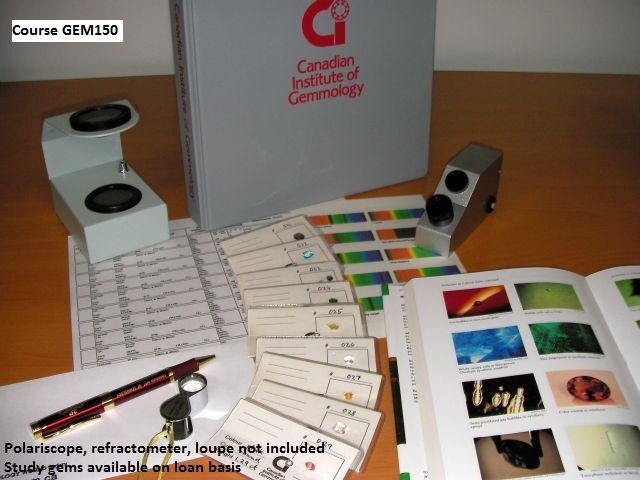 If completed by distance education (Canadian residents only) student must have access to basic gem identification equipment such as refractometer, polariscope, spectroscope, 10x loupe (microscope), etc. Written and practical final exam. 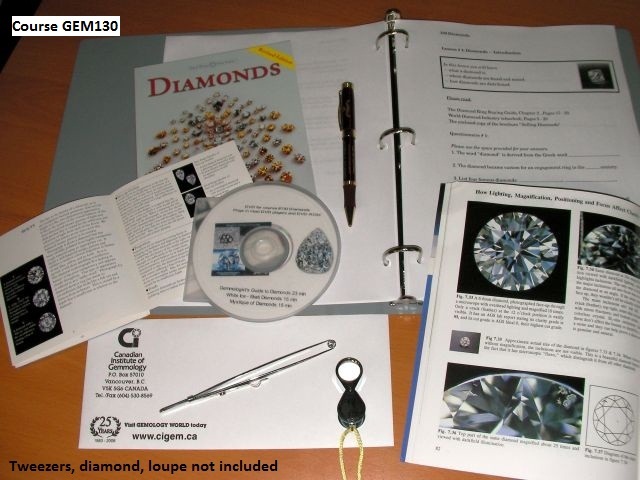 Fee: CAN$ 1,495 includes textbook “Gem Identification Made Easy”. This course is also available as a four-day work shop. Study stone sets will be sent by mail (student is responsible for the timely return of gemstones); guidance is available through Skype video tutorial with an instructor. Prerequisite: Recommended GEM 110, GEM 120 or equivalent. In twelve lessons students learn about pearl types and shapes including South Sea, black and freshwater pearls and how to judge luster, thickness and colour. History, occurrence, identification and the evaluation of jade and opal form the second part of this exceptional gemstones course. 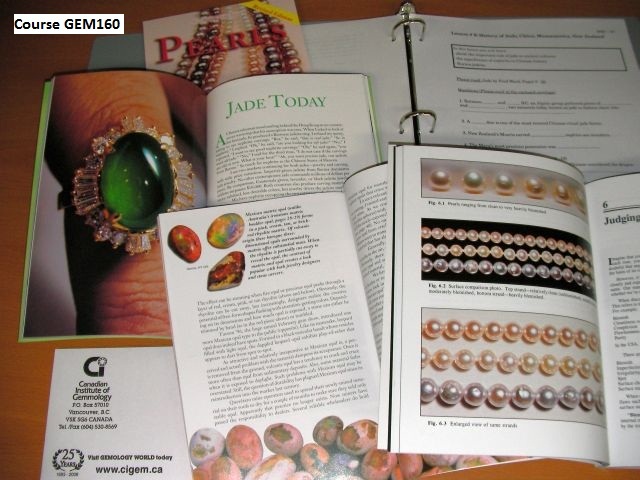 Fee: CAN$ 495 for home-study course (other countries US$ 495 plus US$ 55 shipping within USA) with text The Pearl Buying Guide, Pearl (5th edition), Jade and Opal Gem Series and other study materials.